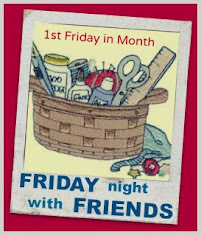 I’ve been a bit ‘blah’ this week so haven’t been around to let you know so here’s just a quickie to remind you, if you haven’t already done so, don’t forget to sign up for FNSI tonight and join with us on our virtual sewing Friday get-together. You can go HERE to link in and, after the weekend, Mr RNG and I will check through and see what you’ve been up to and award not one, but TWO FNSI prizes this month. Two 1-metre lengths of Christmas fabrics….perfect timing, right?? So make sure you’re linked up so we can come and meet with you! I’ve started a bit early and I’ll be continuing working on these cuties…..
What will you be up to?? Sugary hugs and see you soon! Nice Christmas stitchery's to play with. I have a quilt under the machine to do.. thanks..
Hope you feel better soon. That is such a fun project to stitch and put together. Just finished my FNSI with you. Had a very productive night too! I hope you'll be feeling much better soon, Wendy. Tis the Season is such a lovely pattern. Hope you're feeling better. Love your new stitchery. You're all done and I'm just beginning. Couple of things on my plate . . . hand quilting a wall hanging and attempting a new pieced block. Love and hugs. No doubt it is perfect timing. The fabric is really cool. The elegant designs are also really good and well made.